The perfect pint sized travel companion – Travel Buddies by Trendy Kid! Thank you to Trendy Kid for providing me with a sample to review. Traveling with kids can be stressful. In fact, I think stressful may be a bit of an understatement at times. I always have to make sure I have a bag large enough for drinks, snacks, diapers, wipes, play items, crayons, extra clothing in case of accidents and other odds and ends. It seems there is never a large enough bag for everything I need. Well, thanks to Trendy Kid, I can lighten my load and make my kiddos feel special by having their own luggage with Travel Buddies! Trendy Kid was started by a mom and dad team who wanted to bring traveling ease to families, thus creating Travel Buddies. 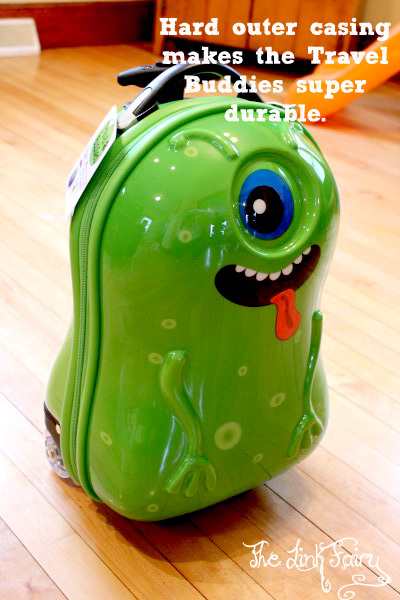 Travel Buddies are a line of kid friendly luggage by Trendy Kid. They feature hard outer shells, easy rolling wheels and a pull handle with two different heights. Travel Buddies come in fun characters that kids will enjoy toting around such as an alien, lady bug, parrot, robot, and penguin! What makes Travel Buddies even more neat, is that they are designed by kids themselves! They’ve even been featured in the movie Admissions with Tina Fey and Paul Rudd! We received Archie, the Alien to test out. He arrived nicely packed and ready to go out of the box. My son was going bonkers once he saw him! Archie is the perfect size for kids; my son is 2 and my daughter is 3.5 and he was just right for both of them. The design of the alien is fun, bright and isn’t a sticker which a big bonus! The outer casing is hard and durable which is really nice, especially since I know it’s going to get tossed around. Archie the Alien is 18 inches tall, so he’s the perfect height for a carry on and the zipper runs almost completely around the entire case, making it easy to pack. The inside is lined with a polyester material and features a zipper pocket on one side and elastic straps on the other for keeping items in place. Plus the case is nice and deep. I was able to fit 7 diapers, some toys, a travel wipes case, a spare set of clothing and a bag of snacks easily! Each Travel Buddy also has a pull handle that extend to two different heights. This is great for kids of all heights and allows the case to grow with them. It also has a carrying handle and the case it’s self is nice and light. The wheels live up to their easy roll name and roll quietly and smoothly. Aside from offering rolling luggage cases, Trendy Kid also offers hard shell backpacks to match their rolling luggage that can be purchased in a packaged deal . Along with a line of tween inspired travel cases called Travel Kool and a portable fabric highchair called a Totseat! Travel Buddies are a great way to get your kids involved in your trip while making your load a little lighter. Even if it’s just a trip to Grandma’s or a sleep over, having their own Travel Buddy allows them to roll their belongings along with them in a new, fun way! 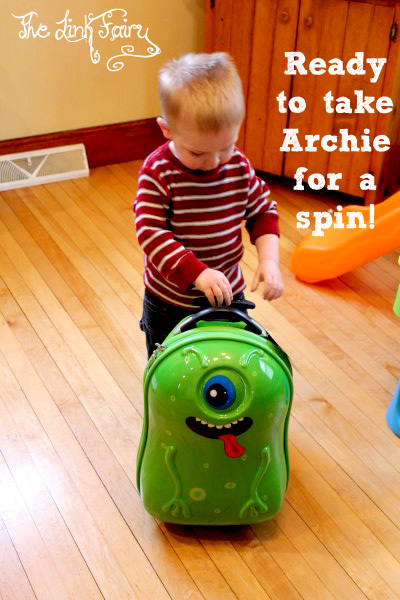 Travel Buddies can be purchased on Amazon.com starting at $73.64 for the rolling case and backpack of Archie the Alien. You can also find them on Trendy Kid’s website. Be sure to follow Trendy Kid on facebook and twitter to stay up to date on their latest products and deals! Enter to win a Travel Buddies Back Pack! 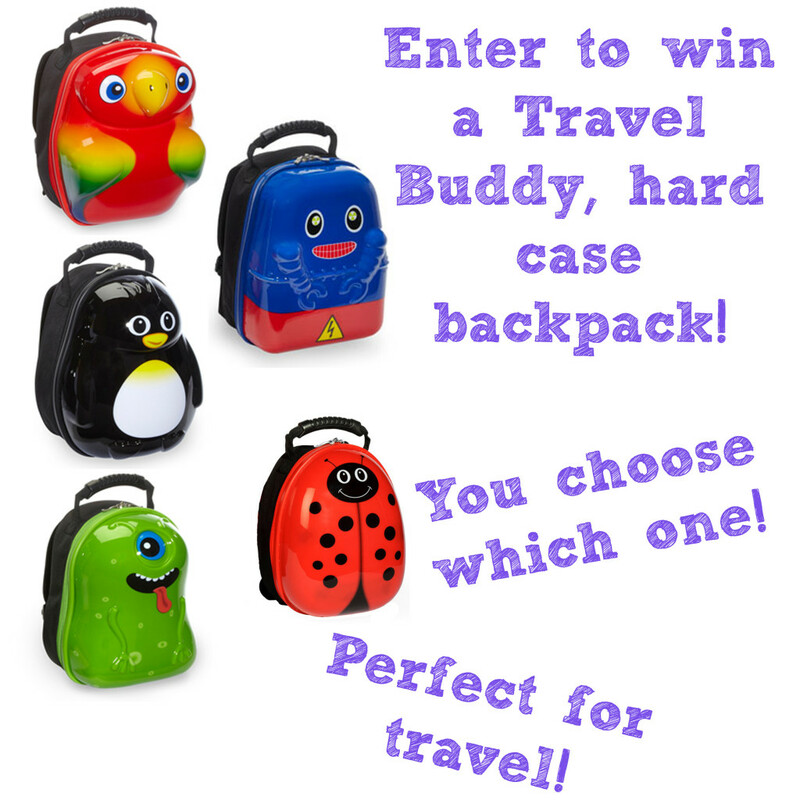 Enter to win your choice of a Travel Buddies Backpack from Trendy Kid! Giveaway ends on 5/11 at midnight. Open to US residents 18+. The Travel Buddies – Lola Ladybug , for my little ladybug. Archie Alien is too cute! My 3 year old son would love that! I’d definitely get Archie Alien for my son- he’d have so much fun with this! Tough choice, but I’m going to go with Percy Penguin. Love them all. I love Popo Parrot and Percy Penguin! My 3yr old son Kyren says Archie Alien, win it momma!! percy penguin, my son would love that one! I would choose the Penguin Case. So cute!! would love the lady bug for my little girl its just so perfect in every way …. My daughter would like the ladybug! I love Archie Alien! Thank you for the giveaway! Love the Travel Buddies – Archie Alien (Case)! I like the Lola ladybug! Archie Alien – so cute !!!!! I would choose Lola Ladybug for my granddaughter. Those are ADORABLE!! SO sweet! companies seem to have become a lot more creative now a days! I love all of these! Percy the Penguin is too cute. I like that the bags have a hard outer shell. It’s perfect for those inevitable falls to the ground. So cute! My son would LoVe the robot! Percy the penguin for sure!! The ladybug! My girls love ladybugs. Percy the Penguin!! Too cute!! I like the penguin and ladybug. They’re both so cute. They are all so cute but I think Percy Penguin is my favorite! aww the ladybug is too cute! Love it! Archie Alien is my absolute favorite!!! But I bet my girls would love Popo Parrot the best!!! These are all so cute!!! That would be so perfect for my daughter. She is about to take her first plane ride to TX in June. I forgot to add she would definitely choose the Penguin. Love these! My son would really love one! I would have to get the Percy Penguin. how cute are these, love that the inside is soft and easy on the clothes and fingers, really like that the outside is hard shell, so you don’t have to worry about things breaking.. I like this product. My son would to have this when we travel. Thanks for the review.